Simple Minds new album "Our Secrets Are the Same" has still not been released by EMI. As it seems, the record company is not willing to release the album in the near future. "Radio Catalunya" in Barcelona has begun to broadcast the songs of the new album in their weekly show "Tarda Tarda". The songs have been recorded from the radio and were distributed among fan circles via the internet in MP3-format. According to the wish of the band all links to download the files have been removed from the respective websites. Simple Minds and EMI are in legal battle over the release of "Our Secrets Are the Same". The band wants the album, which has been well received by most fans, to be pushed by EMI. EMI hesitates to give it a proper US-release. It's questionable whether the album will ever see the light of the day. The legal battle between Simple Minds and EMI is over. The band regained the ownership of the album, but with two new releases and a "Best of"-CD coming it is unlikely that the album will be released. Bootleg copies of the radio MP3 files have now been bootlegged and are being offered for sale, e.g. at eBay. Be cautious: no promos nor fanclub material of this album were ever made. There's only a leaked EMI CD-acetate. The offered CDs contain the radio broadcasts already known. Simple Minds have closed a two album contract with Eagle Records, a subsidiary of Edel Music. The first new release - a covers album - is scheduled for September 24, 2001 and bears the title "Neon Lights". Among others the album contains cover versions of songs by The Doors, Van Morrison, David Bowie, Kraftwerk, Patti Smith and Roxy Music. More good news: a second album release with new material and a world tour are expected for 2002. It has been confirmed that the release of "Neon Lights" will be preceeded by the release of a strictly limited 4 track EP. The EP will feature the Patti Smith song "Dancing Barefoot", Van Morrison's "Gloria" and two more songs that will not be found on the album. The CD should best be pre-ordered, since there will be 10.000 copies only! On August 30 Jim Kerr was interviewed by Mark Goodier on BBC Radio 2. Jim confirmed that there will be a world tour next year. You can read Simon Cornwell's transcript of the interview here. Pure Groove Records released a remix of "Homosapien" by Malcolm Duffy on December 3. Apparently the remix was comissioned by the band and is well received in some London clubs. It's a club remix featuring Jim's voice over some funky grooves. If you're interested, you can order both the CD-single and the 12" from the Pure Groove Records website. The new studio album and follow-up to "Neon Lights", until now referred to as "Eagle 2", bears the title "Cry". "Cry" is also the opening track of the album and the first single. There will be two different CD-singles and two album versions, but it is not yet clear, in how far the releases will differ. On simpleminds.com Jim Kerr gave a track by track discussion of the new studio album "Cry". By what can be read from Jim's short description the album is a mixture of the earlier, more electronic material and the optimistic and buoyant sound that characterized "Once Upon a Time" and "Our Secrets Are the Same". Click here to read the full transcript! Here is the release information for the "Cry" silver and bronze editions (18 march 2002). Here is the release information for the 2nd single from "Cry" (17 june 2002). Simple Minds will get a Lifetime Achievement Award in the Netherlands. The "Edison Award" will be presented to them in the Heineken Music Hall (Amsterdam) on February 27. The band will perform one track live. Check out the official site for the awards. Simple Minds are featured in the introductory text for the nominations as being honoured for their lifetime contribution to the history of pop music. Over the last few weeks the first official dates for the upcoming World Tour have been announced. The tour kicks off in the UK in April, then heading over to The Netherlands, Belgium, Germany, France Spain and Italy in May. The first North American gig is scheduled for June. A couple of shows are sold out already. More dates are expected with the release of the new album "Cry" (April 1) coming nearer. Click here to view a full list of tour dates! Virgin released the new "Best Of" double-CD on November 5. For fans the set is a bit disappointing, as it features no new bonus material by the band. Instead they added the TFGC club remix "The Real Life" by Raven Maize. However, all the songs have been digitally remastered and sound superb. Some versions are different mixes or edits than the album versions. 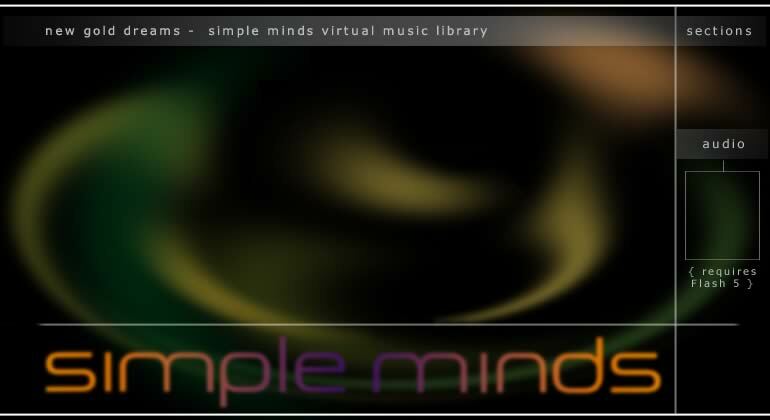 simpleminds.com is finally online again since October 2001. The website cannot replace Simon Cornwell's excellent Dream Giver, but comes up with some nice ideas. Don't miss Jim's "Journal", offering insight into the mind of the man himself, and the behind-the-scenes "Exclusives". Whether you like the discussion forums or not is a matter of taste. At least you'll find a lot of fellow minds there. The website is still being developped. You'll have to register with simpleminds.com, in order to view all the sections. Recently two more remixes of Simple Minds classics saw the light of day. "Belfast Trance" is a rendering of "Belfast Child" by John "00" Fleming and was released by Virgin Records on January 14. There's another remix, very close to the original, played on the radio. It's called "Monster" by Liquid People and is a remake of "Changeling". Check out Simon Cornwell's Dream Giver for more information! There's a lengthy press release putting the recent events and future plans of Simple Minds into context. The focus is the new direction of the band in view of the upcoming silver anniversary tour. After the low-scale release of "Spaceface" more releases are to be expected. The Live-DVD is postponed, but a remix-album is planned for later this year. 2003 wiil see a new studio album and probably a remixed and extended version of "Our Secrets Are the Same"
On 30 September Virgin is going to release the first six albums digitally remastered. There will be a regular reissue and a limited edition packaged in a miniature reproduction of the original album artwork for each album. For a more thorough news-roundup check out Dream Giver by Simon Cornwell. There's a new Belgian fan-club called "Sparkle through the Years". Read all about their activities and how you can subscribe if interested. There are a couple of new remixes and DJ-promos making the round. For a comprehensive overview check out Dream Giver by Simon Cornwell. The release of OSATS seems to be postponed. In the meantime "Early Gold", a collection of tracks from 1979-1982, has been released. While recording and producing the new album expected for early 2004 Simple Minds will be playing some live dates including a few summer festivals and a subsequent European tour beginning in autmun. Check out the tour dates and the list of songs played.